Are you looking for a fresh vacation rich in homegrown mountain heritage? Well, you have found the perfect spot right here in Haywood County! The North Carolina Smoky Mountains are immersed in Appalachian traditions and true southern hospitality. No matter what time of year it is, there is always a unique way to explore the area’s cultural roots with plenty of heritage hotspots right here in Haywood County. First established in 1808, Haywood County was named for John Haywood, North Carolina treasurer from 1787 to 1827. The county hosts the Blue Ridge Parkway running along its southwestern border and the Great Smoky Mountains National Park, including historical Cataloochee Valley, and the Pisgah National Forest in the northern section of the county. Haywood County offers a wide range of activities throughout the year including hiking, skiing, fishing, kayaking, farm fresh food, elk watching, mountain music, and historical hotspots. The area is also known for its many unique and exciting events that incorporate the area’s Appalachian heritage throughout the year, so no matter when you visit, there are sure to be some homegrown happenings taking place. 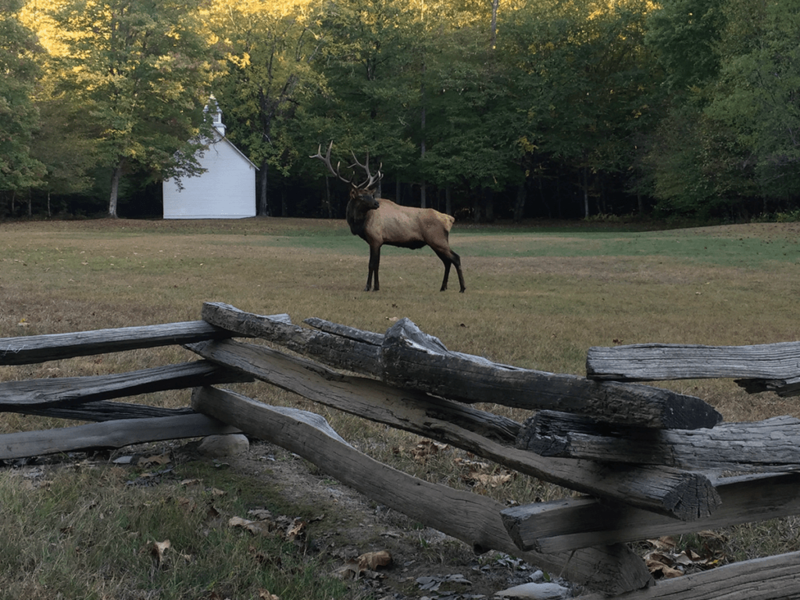 Start your day bright and early with a visit to see the reintroduced elk of Cataloochee Valley, which are most visible during dawn and dusk. The valley is one the most remote parts of the Great Smoky Mountains National Park and is rich in mountain history and beauty. The area is laced with abundant wildflowers and wildlife including elk, white-tailed deer, black bears, wild turkey, butterflies and many species of birds. The tranquil scenery is sure to inspire the inner artist in everyone. With several hiking trails, streams for fishing, and preserved buildings from the early 1900’s, there is plenty to explore in the valley. The Wheels Through Time Museum is home to a premier collection of rare American Vintage Motorcycles and other classic transportation displays. The museum houses over 300 of America’s rarest and most historic classic motorcycles, with over 24 marquees on display, including the likes of Harley-Davidson, Indian, Excelsior, Crocker, Henderson, and much more. After lunch, spend the rest of the afternoon strolling down Waynesville’s historic Main St. and visiting the many specialty stores that line both sides of the street. This area underwent a successful revitalization project several decades ago that restored the small town to it’s original quaint mountain charm. The 46 miles of twisting mountain roads that run through Haywood County are one of the most popular attractions in the area. Hop on the parkway from Hwy 23/74 and head North towards Canton for an exquisite drive through the Balsam Mountain Range, which is where Haywood ‘s native bluegrass band, Balsam Range, got the inspiration for their name. Stop and stretch your legs at two of the counties most popular hiking areas, Graveyard Fields or Devils Courthouse, which are sure to inspire you too! Experience the premier producer-only farmers market in the Waynesville area. Take your pick of a variety of fresh produce, meat, plants, locally made food items, heritage crafts, and more. Agricultural heritage plays a huge role in Haywood County’s history with over 700 working farms still harvesting our lands to this day. Many of those farmers and producers are present at the market and are also highlighted on the Buy Haywood “Find Your Adventure” Agritourism Guide. As one of the stops on the Haywood County Quilt Trail, the Shelton House is a must for anyone intrigue by the heritage of Haywood County. It was built in 1875 and is listed on the National Register of Historic Places. Housed in and around the Shelton House, the Museum of North Carolina Handicrafts features comprehensive exhibits of 19th century crafts. Pick up a quilt trail guide at the Shelton House or at the Haywood County Visitors Center to begin your next heritage adventure. The quilt trail project helps Haywood County tell it’s history by featuring colorful and meaningful quilt squares installed on barns, public buildings, and shops around the community. Quilts represent a much-loved symbol of comfort, family, heritage, and community, and the blocks on the trail provide splashes of color along major roads and in the rural countryside. Restaurant Suggestions – Haywood County is home to such a wide range of locally owned and operated restaurants that we couldn’t just pick a few! From casual, down-home eateries to gourmet, fine-dining and everything in between, we have it all here Haywood. For a full listing and more information, visit our Dining Page.